86 • March 2019 • S I G N & D I G I T A L G R A P H I C S ARCHITECTURAL AND ENVIRONMENTAL material; powder coating to add color with paint; and plating with nickel or chrome plated parts, a process to electro- plating a thin layer of nickel or chrome onto metal. Powder coating works well for both interior and exterior uses, while color anodizing is susceptible to ultraviolent light and is better for interior use only, Borden says. Metomic Corporation offers standoffs in two finishes, anodized brushed alumi- num and polished chrome, adding to the look of the sign, Bernstein says. "Standoffs provide a dimensional effect and greatly enhance the ordinary vanilla acrylic sign. They breathe new life into everyday signage," Bernstein says. 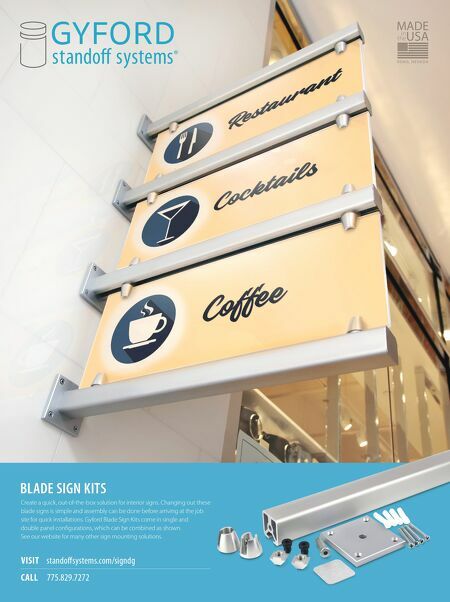 "They allow the sign maker to enhance the product for his customers and increase his or her sale at the same time. Mounting hardware used effec- tively can become its own profit center for a business owner." SDG A unisex restroom sign featuring standoff from Metomic Corporation. MBS Standoffs, Tampa, Florida, demonstrates a basic application of the options for using standoffs to display signage systems. A common appli- cation of how a cable-and-rod sys- tem can be used for signage appli- cations. Image courtesy of MBS Standoffs. 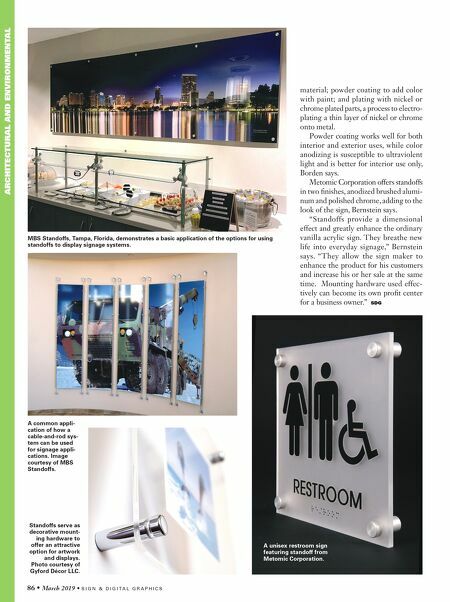 Standoffs serve as decorative mount- ing hardware to offer an attractive option for artwork and displays. Photo courtesy of Gyford Décor LLC.